After finishing first and second in the Big 12 in total defense the past two seasons, West Virginia slipped to eighth last year. Injuries and inexperience contributed to WVU giving up 10 more points per game last season than it did when it led the league in that category in 2016. It also didn’t help that Big 12 was stacked last year with an outstanding group of experienced quarterbacks. Thankfully for WVU, many of those star quarterbacks are now gone. Heisman trophy winner Baker Mayfield at Oklahoma … off to the NFL. No Mason Rudolph at Oklahoma State. Two-year starter Kenny Hill is gone at TCU. As is Texas Tech’s starting quarterback from last year, Nic Shimonek. Will that make it easier for West Virginia’s defense in 2018? What should we expect from the WVU defense this season? Most fans know by now, a successful defensive unit starts up front. Gibson told us last summer on Sportsline that he was concerned about his group up front compared to the 2015 season.He liked the talent, but they were so young heading into last season. His concern ended up being valid. True freshman Lamonte McDougle was forced to play significant snaps as did fellow true freshman and Fairmont Senior product, Darius Stills (more on him coming up). Reese Donahue (Cabell Midland High School) played a ton as a sophomore. Ezekiel Rose, a junior college transfer, was another unknown who was plugged into the lineup. While the group certainly struggled at times last year, they gained invaluable experience. 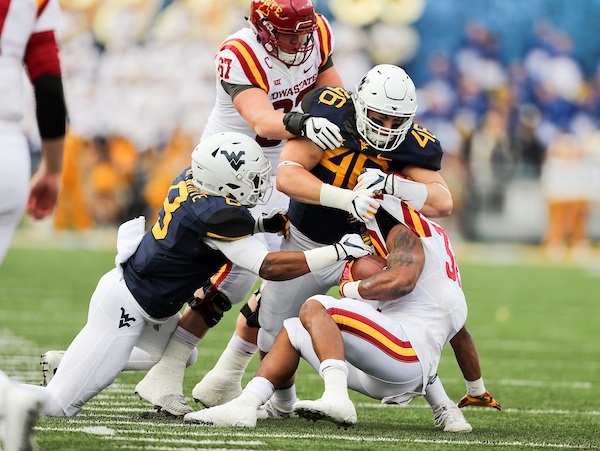 Even though the off season has seen the announced departures of McDougle and starter Adam Shuler from the group, Gibson feels this may be the deepest defensive line he’s had at WVU. Stills has been one of the defensive standouts of the spring. His athleticism and quick hands had Gibson raving about his potential in the middle. Add in Donahue’s experience and the emergence of Rose last season as one of the more talented playmakers on the entire defense and you’ve got some good building blocks. Penn State transfer, Brenon Thrift and just signed USC graduate transfer, Kenny Bigelow add size and high end talent to the group. True freshman Dante Stills (Fairmont Senior) arrives in Morgantown has one of the most highly recruited players ever to come out of north central West Virginia. Gibson feels he will contribute right away. They will obviously have to produce on the field to ultimately be considered the deepest group he’s had, but exiting the spring Tony Gibson is excited about the potential of the of this position group. Another unit that had its struggles at times last year, but should be strengthened this season with that ‘trial by fire’ experience from last year. Derek Pitts (South Charleston High School) saw time at safety last year as a true freshman, but has moved to corner. Gibson loves his attitude and athleticism. Hakeem Bailey had a tremendous spring, according to Gibson. Bailey’s cover skills have been superb as they were this time last year. Gibson felt most of Bailey’s struggles last season came from a lack of confidence. The skills are there. Now it’s a matter of producing on the field to allow the confidence to catch up. Per NCAA regulations, Gibson couldn’t talk about UCLA grad transfer, Denzel Fisher, but there’s no question he will be in the mix for significant playing time at one of the corner positions. One of the surprises last season was the outstanding play of true freshman, Kenny Robinson. Robinson started the season at safety, but was moved to corner when it became obvious some playmakers were needed at the position. He came through. Three interceptions, including two for touchdowns, gave fans a glimpse into what could be a very bright future. 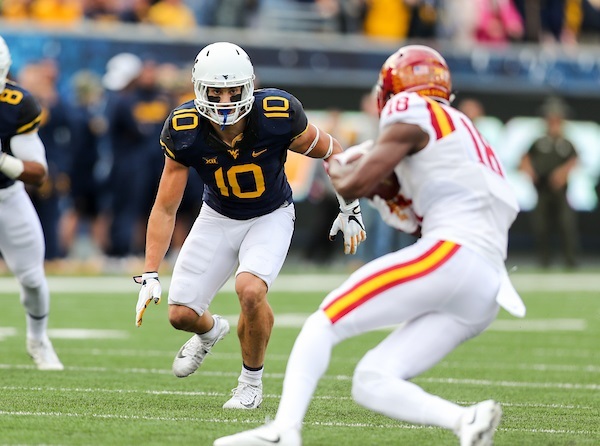 Robinson has been moved back to safety for the 2018 season and is expected to be one of the defensive leaders for WVU this fall. Dravon Askew Henry returned last season after missing the entire 2016 season with a knee injury. While it was certainly a boost to the young defense to have Henry back last year, it appeared at times that Henry was playing tentatively. Returning from a knee injury is never easy. Forget the physical part. Often times, it’s the mental side that offers up the biggest hurdle. Gibson says any hesitation that may have existed on Henry’s part last year is gone. He has that look, Gibson told me. He’s ready to go. Any discussion of this position has to start with David Long. He was nothing short of spectacular last season. Long missed the first four games as he recovered from injury, but wasted no time in showing his value when he returned. Eighteen tackles against Oklahoma State, including seven for a loss against the Cowboys highlighted an All-American season for the sophomore from Ohio. Gibson told me last summer he thought Long could make every tackle in a game if that’s what he was asked to do. After watching him last season, I don’t think Gibson was joking when he said that. Bridgeport native, Dylan Tonkery had another outstanding spring. His athleticism has never been a question. Add to that, the experience he gained last year playing in all 13 games and Gibson expects big things from the redshirt sophomore. Gibson made sure to mention this group is nowhere near ready for the first game. There’s a lot of work to be done before WVU opens the 2018 season in Charlotte against Tennessee. However, he mentioned several times how much he enjoys this group and looks forward to seeing what they can do on the field come September. To watch the full interview with Tony Gibson, click HERE. 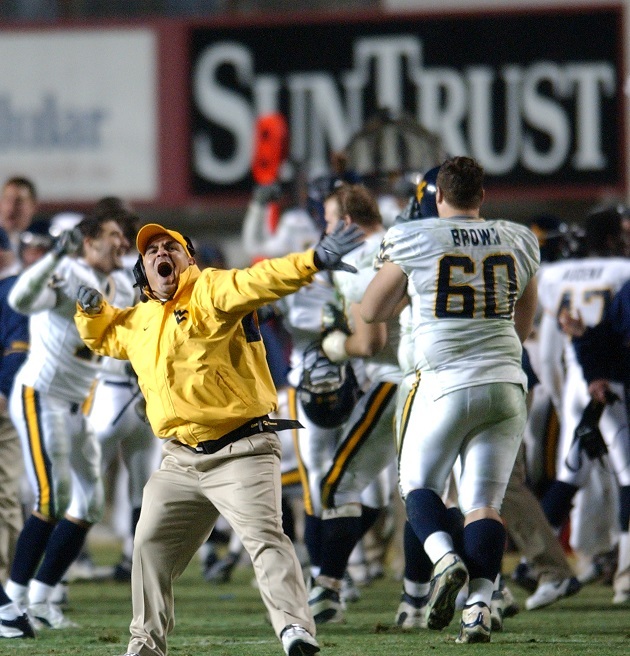 Editor's Note: Top photo is of Tony Gibons and courtesy of WVU Sports Communications. Second photo shows lineman Reese Donahue making a tackle, while Kenny Robinson returns one of his two interceptions for a touchdown last year in the third photo. Bottom photo shows Dylan Tonkery looking to make a tackle against Iowa State. Bottom three photos by Ben Queen of www.benqueenphotography.com.